Plus points for cute color, size, name, etc..
Plus points for brand name, Singer, Necchi, Pfaff, etc.. I expect to do things like clean, replace belts and bobbin tires, light tune up. So, following the rules I found what appeared to be a machine that fit my criteria really well and I snapped it up, only $20! If you've never been introduced to one of these gems you might understand how easily I was deceived. 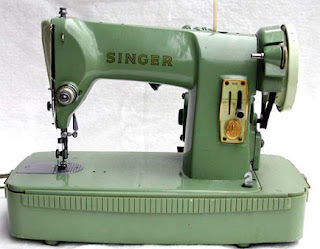 This machine looks like an upgrade/sister to the Singer 185 which is known to be a nice robust little straight stitcher. The 185 (pictured right) is a repackaged 99 (pictured bottom) which by the time these machine were being produced looked seriously outdated. (the 99 that is) Besides the color the 185 and the 285 looked almost identical, who wouldn't be fooled? The video has been posted for a week over at YouTube but I've just now had the time to get this little write up together. It's a slide show, music, picture in picture commentary AND video of the machine in operation. How's that for mashing everything into one clip! Ha. I've heard about these (in whispers) but never saw one in action. Rattle your teeth (and possibly your walls). Alas. I suppose that explains the $20 price tag. I enjoyed the video, and your review. I have one of these too. I admit, they are built different. I also admit, that the machines I collect really do not get much use, so I enjoy having every one for a bit of history, and a display of old machines. They all have a history, and this one may be a bit unique, but that is what makes it special. Thanks again. Thanks Brian! Very helpful review. I was given a 185K recently in the same case cover and base. When I cleaned it the supports disintegrated! Fortunately I had a base from a Spartan 192 that it fit great in. The Spartan was moved to a grass cloth case made for a 99.
how do you think this would work converted to a hand crank machine?